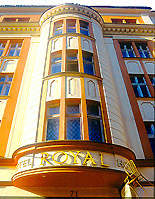 The Royal Hotel is located along Poznan's main artery in a historical tenement house complex. In 1918 it was the site of the main headquarters of the Wielkopolska Uprising leadership. We kept this rich history in mind while creating the hotel's current appearance. The Royal hotel offers 27 stylish, single and double rooms and studio type rooms. Each rooms is equipped with a bathroom, telephone and TV Sat. Our restaurant offers delicious dishes of Polish and European cuisine. 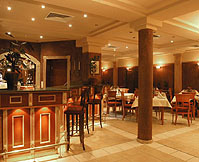 We also invite our guests to the drink bar, where it's possible to have a rest and spend nice time. We participitate in organization of parties, business and casual meetings. Additionally, excursions from the hotel to and outside the city are organized. The hotel's location in unusually close proximity to all of Poznan's most important sites will certainly make your stay in the capital of Wielkopolska more convenient. It is an ideal place for both businesspeople and tourists alike. The hotel accepts the following credit cards: VISA, MASTERCARD, POLCARD, EUROCARD, DICOVERY, AMERICAN EXPRESS, etc. 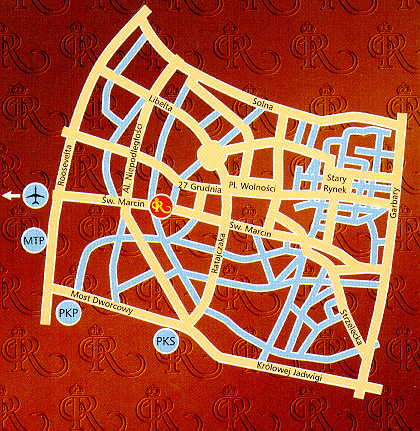 Royal Hotel is located in the city centre, 10 minutes walk from the main bus and railway station.